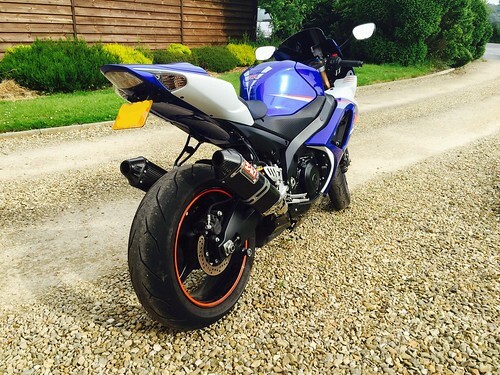 UK Motorbike Forum : Do I really have to these mindless idioms shoved in my face? Managed to get a full day’s worth of riding in on the GSXR1000 K7 this weekend doing approximately 3 hours stints at a time, covering, slow town traffic, filtering, carriageways, motorways, country lanes. On shorter journeys I’ve done the bike has been nothing but sublime taking everything in its stride but, I held off writing a review until I managed to get several hours and hundreds of miles covered in a day. The ergonomics of the bike are fabulous with a not too aggressive ridding position. There is not a long reach to the bars, the bars are not too low, the tank shape doesn’t force your legs into an uncomfortable position etc. I have no issues with wrist/arm pain/fatigue which I used to get on the ZX6R and very much on the R1. The seat is also reasonable, no real complaints to be honest handling a few hundred miles easily but, for regular long distance work I’d consider an aftermarket comfy option. I didn’t experience any issues with the switch gear such as hitting the wrong control by accident (which I do manage to do on some other bikes occasionally). Whilst switch gear is much of a muchness, things just seem to fall at the fingertips easier on this bike. There is some adjustability in the standard foot pegs (up/down – back/forth) out of the crate which, can help a little towards making the bike a touch more ergonomic without resorting to aftermarket adjustable pegs. You can keep your back reasonably straight and when on a faster road, use the wind to help keep your upper body up even more so, again making it great for a painless ride on a sports bike. The long stints I spent on the bike did give me a little cramping in the back of the knee/hamstring area but, I continued regardless. I’ve never been a fan of the minimalistic fairings found on sports bikes after approximately 2003 onwards but, the Suzuki’s body work, whilst it is slim and not too minimalistic, goes in and out in all the right areas and does a fair job at directing the bulk of wind blast off your main body parts. The weight of bike is very neutral with the only noticeable aspect feeling a little top heavy when you lean it over with a full tank of fuel on very slow and tight city turns. There wasn’t any noticeable vibrations despite the mixture of roads and speeds coming in via the handle bars or foot pegs. The dash is very easy to read, with the digital speedometer, easy to read rev counter and a decent sized gear position indicator that is easy to read at glance. I can clearly see why many real world owners views are highly positive for this model and why BVG used his as a daily commuter and a track bike including touring. It was this level of highly positive reviews, coupled with the bike just feeling right the moment I sat on it when looking at them at dealers that put it above any other superbike on the list for me. The bike has a seriously effortless character to it, which, in turn really is a testament to how well it has been engineered to be user friendly. The power is instant, strong yet delivered in an uncanny sublime manner thanks to a silky fuel injection system. The GSXR1000 also pulls impressively well from as little as 1,500rpm in any gear which in turn, allows you to ride it almost like a twist ‘n’ go, seriously reducing the gear changes usually needed on high revving bikes to get the low down drive. The throttle isn’t jerky helping to deliver smooth and accurate drive through and out of corners. This is one bike you can ride easily at the permitted speed limits (or easily beyond if you want). Despite me historically going everywhere above 10,000rpm on a 2007 R1, I have not gone beyond 10,000rpm on the GSXR 1000 due to the satisfying torque and I usually ride it between 2,500rpm – 6,000rpm with the latter being motorway speeds and rarely does the bike ever exceed that. The gearbox is quite slick and smooth, giving a subtle but, assertive click as you tap it into the desired gear. I’ve not experienced a false neutral or a missed gear change to date. There is an optional power selector to vary the power of the engine which, I can only imagine would be required should conditions become very greasy or worse. Coupled with the ergonomics above, all of this makes the K7 GSXR1000 a surprisingly versatile, sublime sports bike’s that takes road riding in it’s stride and in capable hands I have no doubt, a serious tool on a track. I have personally found the bike firm but, highly compliant despite not riding like I used to or having the skill to do so anymore. The bike doesn’t pitch/wallow much with any movement being very progressively firmer on the brakes or acceleration. Whilst you do feel drain covers, over banding, white lines, bumps etc. the bike is not easily upset by them. The bike remains surprisingly well planted under hard acceleration, mid corner and driving out. I’ve never experienced any head shake when historically I’ve had it on both the ZX6R and R1 under similar conditions on the same roads and part of this must be down to a factory fitted (KYB) steering damper further complementing the suspension. Whilst I no longer ride like a loony, the directional changes that the bike appears to be capable of are effortless, quick but with a certain fluidity in the sense that it will change direction, as quick as you instruct it too but not quicker than you expect it to with very minor rider inputs. I’ve never found the brakes overwhelming but that may be down to the lack of the use my bike has had since new. Fluids etc are always kept fresh with MOTUL RBF600 for brake and clutch so it’s not degraded fluid to blame. The brakes are strong enough but in a very progressive manner with no sudden bite and a wooden feel. If I rode faster then I would definitely look into braided lines and upgraded pads as a first step. The only problem I have experienced is a blocked fuel filter gauze thingy which was said to result from a lack of use since the bike was new and mainly kept as a living room ornament causing stale fuel to clog it up. I don’ ride it over winter and even after 9 months, with the battery connected, it fires into life instantly without the need of a trickle charger. Steve Jordan have looked after the bike servicing and MOT’ing it annually. Average service bill is approximately £200 and I always supply my own MOTUL oil. They have also advised that in their experience, around this era of sports bikes, the GSXR1000 is the least troublesome they see with regards to issues/faults. compared to its competition. I really don’t like to say that everything is great but, the Suzuki GSXR 1000 K7 is well designed, delivering ergonomics that would make daily riding in any situation a doddle and relatively ache free. The engine is very flexible with decent low down and mid range torque, allowing you to ride in a more relaxed manner rather than worry about rev ranges or a potential gear change. It will deliver the speed and top end as well for junkies. Despite owning this bike for 3 years, whilst it does not make my heart fizz like a Panigale would, it keeps my heart warm as it really is a total package machine that never puts a foot wrong yet leaves me amazed at how sublime a superbike can actually be every time I ride it.